Hiding in My Craft Room: Playing with Some Scraps! This week's challenge is one of my favorites because I'm a craft collector and hoarder! LOL!! I might be a horader but I still LOOOOOVE to make use of the things I have, in this case the things I have saved - SCRAPS!!! Please go HERE to submit your entry! 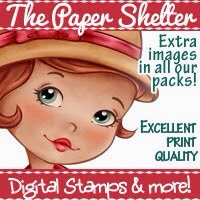 The sponsor this week is The Paper Shelter! These are a great resourse when you just need a quick layout to get your mojo flowing. I also like the Mojo Monday sketch challenges. I haven't done one is sooooooo long! Oddly enough it is Mojo Monday challenges that made me even start a blog all those years ago. Maybe HIMCR challenges will have someone say that about it in the years to come! 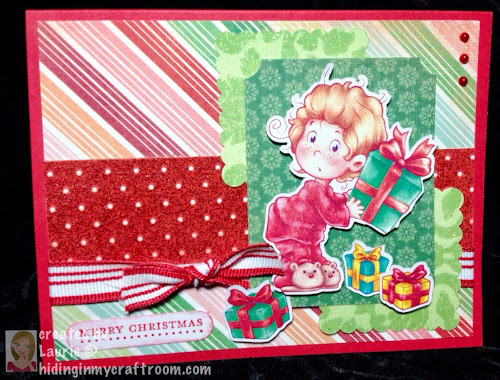 Card front: DCWV 'Tis the Season Stack 4" X 5 1/4"
Very cute, Laurie. Merry and Bright :-) Love it!